New York photographer, Gail Albert Hallaban, has used this theme as inspiration for two fascinating books. Her first book, Out My Window”, is a collection of photographs focused into the apartments of New Yorkers. 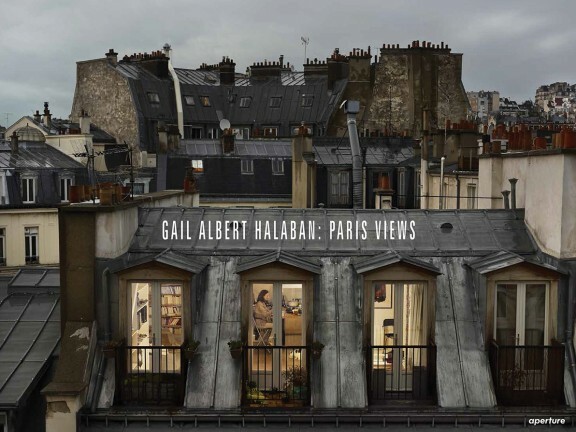 “Paris Views” is Halaban’s visually narrative view over the legendary rooftops, across cobblestoned courtyards and wide boulevards, and into the windows of elegant Haussmannian buildings, quaint garrets, and concrete contemporaries, revealing intimate moments in the lives of Parisians. Rémy worked with Halaban to find subjects, via Facebook, friends of friends, and word of mouth. Through her eye, Halaban’s subjects become like characters in a painting, framed by the architecture of the homes in which they live. Paging through Paris Views transports me back to Paris, where I would, most likely, be gazing out of my hotel into the windows of my Parisian neighbors. All participants gave their permission to be photographed for the book.